If you are in retainers, have clear plastic aligner trays, or don't have braces at all, you can enjoy the convenience of individually packaged floss made by Fresh & Go. Each individually sealed floss sachet contains one strand, 18 inches, of mint flavored waxed floss. There are 10 sachets per package. Just tear, pull, floss, and toss! 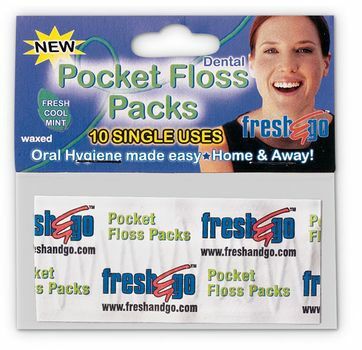 These little floss packets fit easily in your purse, pocket, backpack, or DentaKit Braces Survival Kit. If you are looking for the Fresh&Go pack of 24 sachets, unfortunately those have been discontinued by the manufacturer, and replaced with these new packs of 10. Each strand of floss is individually sealed in a paper packet. The floss is waxed and mint flavored. You get 24 Flossers per package. If you don't have braces and want the convenience of clean teeth when you're "on the go," you'll love these floss packets. I keep them in my purse and my kids keep them in their backpacks. It's a high quality product made by the same company that makes the Fresh&Go toothbrush. I love that I can carry these in my purse - they take up no room at all. I will purchase again!